En route home from the Transition Hubs gathering, I had the enormous privilege of spending a day in Venice, wandering around with no destination in mind (the best way to explore Venice in my opinion). For me, it is the most beautiful place in the world. It is a jewel, a gem. Somewhere deeply remarkable. While tempting to focus more on the challenges the place faces, and how fragile and vulnerable it is, what I want to do here is to share some reflections from my time there, and how it speaks to the context of our ongoing conversation here about imagination and why it matters. “The scientific literature on curiosity, while it disagrees on many things, agrees on this: a person’s curiosity is more state than trait. That is, our curiosity is highly responsive to the situation or environment we’re in. It follows that we can arrange our lives to stoke our curiosity or squash it”. Venice is a place that has evolved in such a way that absolutely stokes the curiosity. Every step fires it up. You look up, you look down, you look left, you look right, everywhere there is something that invites you to explore, to examine, to enter, to reflect. Perhaps it is the acoustics of the place, car-free, bicycle-free, motorbike-free, just footfall, human voices, pigeons and distant boats, that puts us into an altered state we’re not used to, one in which our attention can flourish. It struck me how many of our towns and cities had been similarly curiosity-tickling, but were lost in various recent wars, and what a huge loss that is, especially when you reflect on what we’ve replaced them with. While walking, we were passed by a group of schoolchildren, walking and singing. It was captivating. At every step, every turn, curiosity is invoked: “what’s down there?”, “how did they do that?”, “wow, look at that!”. It puts you in a state of seeing the world in a way that a child sees it. I come from a country which seems intent on squashing curiosity. As a culture, we are, as Ian Leslie puts it, “at the very least, in a lull”, when it comes to curiosity. He goes on to write, “if you allow yourself to become incurious, your life will be drained of colour, interest and pleasure”. And that is very much what, it feels to me, is happening. This was encapsulated for me recently on a trip to Manchester, where I came across the new Premier Inn in the city centre. Check it out. Sit with it. Breathe it in. How does it feel? Here was the single dullest, most uninspired, most obnoxiously antisocial building I’ve seen for some time. A black monolith, it has no relationship to the other buildings around it. It offers no way to interact with it, other than to walk through the front door. But worst of all, it’s boring. Vastly, achingly boring. And that really matters. Here are some photos of it. Just spend some time with them, and allow yourself to observe how it makes you feel. Research shows that built environments that create boredom can lead to increased heart rates and sadness. It also shows that in “active facades”, i.e. built environments that activate our curiosity, pedestrians are 5 times more likely to offer help to other people than in environments that don’t. “The holy grail in urban design is to produce some kind of novelty or change every few seconds, otherwise we become cognitively disfigured”. “Cognitively disfigured”. That’s certainly how I felt as I walked past, stopped, and contemplated the Premier Inn building in Manchester. But such buildings are becoming the norm in our towns and cities, as the unimaginative and the banal increasingly dominate. We build more and more places that offer no reason to care about them, and then we wonder why nobody cares. Suzanne Moore, writing recently about Hackney Walk, a new luxury brand outlet, described it as “a place where there is so little relationship between buyers and locals that it feels like two fingers up”. Check out the beautiful fine wood carving on the lintel here. If you are an aficionado of Christopher Alexander’s ‘A Pattern Language’, it all starts to make sense why Venice is as delicious as it is. Hopefully if you look closely at the pictures you might spot the following patterns: The Magic of the City (10), Web of Shopping (19), Four-Storey Limit (24), Sacred Sites (24), Shopping Street (32), Degrees of Publicness (36), Quiet Backs (59), Small public squares (62), Positive Outdoor Space (106), Half-hidden garden (111), Hierarchy of open space (114), Courtyards which live (115), Arcades (119), Building fronts (122), Activity pockets (124), Stair seats (125), Something roughly in the middle (126), Tapestry of light and dark (135) … just to name a few. Venice is a Pattern Language masterclass. Taking a copy of the book to Venice would be as useful as taking any guide book. Of course, we can’t knock every town and city down and rebuild it as a mock pastiche Venice. Venice was like the Dubai of its time, an unimaginably wealthy trading port with more money than sense which hoovered up the best stonemasons, architects, builders and artists in the world to create something remarkable as a showcase of its prowess. But we can take its patterns. We can recognise that any new buildings have a responsibility to invoke our curiosity. That they should be beautiful, intriguing, and they should open up new possibilities. There is something in Venice also about the colours that you see, which are all natural colours, like shades of earth pigments, nothing too garish or intense (I imagine there must be a chart of permitted colours or something). There are the materials too: old, corroded bricks, oak beams, patches of wall that are plastered, and parts that aren’t, cobbled, and stone slabs underfoot. “My experience with adults and children has shown me that our late twentieth-century imaginations are often broken, fearful, warped, obsessive – and yet given guidance, inspiration and encouragement, they can become, even quite suddenly, wholesome and radiant”. 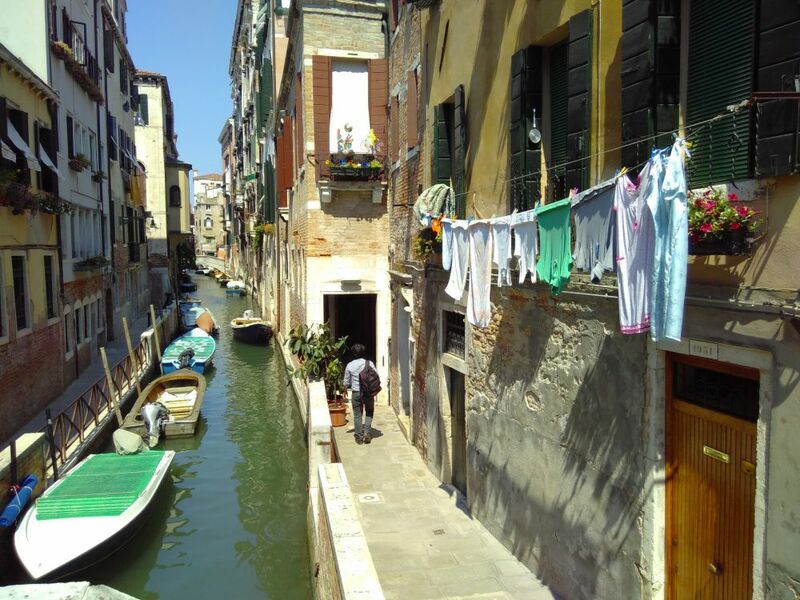 Venice, for me, is a brilliant embodiment of that “guidance, inspiration and encouragement “. Our built environments have a key role to play in such a transformation, and the act of enabling the spaces around us to make us as curious as possible might well be one of the most important things we can achieve in the time ahead. Appreciating the inspiration that moves me to respond to Rob’s posts. It’s a wave length, a language that unites rather than divides. It’s a focus that transcends ego drama and all architecture built on that false identity. May those walls come tumbling down. thought-provoking post Rob, thanks. I was in Venice about 25 years ago and it provided an atmospheric backdrop to a relationship meltdown! Happy to say I’ve found other cities since with more positive associations. Do you know the great Andalucian cities of Sevilla, Granada or Cordoba? My sense of curiosity is never exhausted in those places – chiefly because of the variety of urban design and architecture reflecting the various peoples that have lived there – in particular the Moors of medieval al-Andalus. Keep up the great work! Really enjoyed reading this Rob – thanks. Seems like there’s the beginnings of a “How to stoke your curiosity handbook” which starts… Step #1 – visit Venice and Sevilla. Might be interesting to look at “inner” curiosity too – what makes some people really curious about their inner workings and some people not. I’m sure there are strong parallels with the outer world.